Palestinian cartoonist Mohammed Sabaaneh is under investigation for drawing a cartoon that was widely interpreted as depicting the Prophet Mohammed, although the artist himself insists the figure was only a symbolic representation of the Muslim faith. Only a short time after Palestinian Authority President Mahmoud Abbas marched in solidarity with Charlie Hebdo in Paris, he called for “deterrent action” against Sabaaneh and Al-Hayat Al-Jadeeda, the newspaper that published the cartoon. 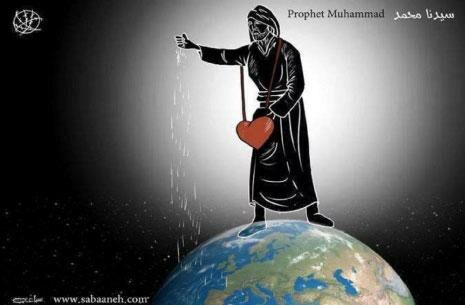 Sabaaneh’s cartoon shows a shadowed figure sprinkling seeds across the Earth from a heart-shaped pouch. Although the drawing carries the caption “Prophet Muhammad” in English and Arabic, Sabaaneh says the human figure “symbolise[s] Islam and its role of disseminating light and love on the human race” — a message he feels is being distorted both by terrorists who say they act in the name of Islam and by non-Muslims who believe them. Although he apologized “to the people who received the message with the opposite of what I wanted to convey,” Sabaaneh has been suspended from Al-Hayat Al-Jadeeda and summoned for questioning by police. The newspaper has also formed a committee tasked with investigating the cartoon. This is not the first time Sabaaneh has had a run-in with authorities over his cartoons — but previously the authorities were Israeli. In 2013, he was arrested and held in an Israeli prison, initially without charge, in apparent retaliation for his frequent visual commentaries on Palestinian human rights issues. Under pressure from international rights groups, Israel eventually charged him with having “contacts with a hostile organization” because some of his cartoons were included in a book published by his brother, a member of Hamas. He was sentenced to five months in prison and has continued to address the issue of Palestinian political prisoners in his work since his release.